A good-quality headset need not break the bank. 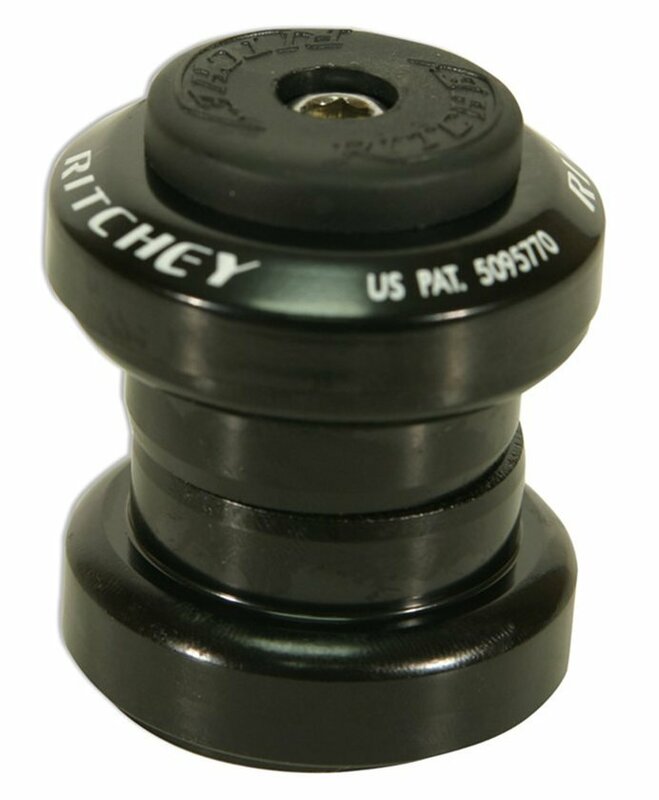 With durable steel upper and lower cups, these will last for years and years with minimal service. As simple as headsets come. This Ritchey has been in use on my commuter for the last few years. It's inexpensive and pretty bare bones. The standard bearings, while sealed by the headset components themselves, are not technically sealed cartridge bearings. This makes a bit of preventative maintenance necessary. I've repacked them once or twice (a five minute job). Certainly not a performance piece of equipment, but it serves its purpose and is well constructed. The guys that run the desk at riverside storefront are the best. It's hard to give a complete review of this because I think the best quality of a headset is long service life. But I've only had this for about a month. Install was easy, looks great, and seems to be good quality. Will have to update when I have some miles on it. Very durable and affordable. Great way to get a bike rolling. Not superlight, nor am I a fan of the nylon top cap...it functions fine, just does not look as good as an alloy top cap. Ride mostly XC and have no mechanical trouble with this headset. I didn't have the correct tool to install the crown race, but a little ingenuity (and web searches) found a suitable method to get things done. The headset seems to be good quality. Since this was my first fork/headset install and the bike seems to be working, I would say it is an OK install. Not quick and easy without the specialized tools but definitely doable. Hard to top this, for the price! Easy order, and quick delivery! Installed this on my winter MTB bike. Easy and no play. However, I decided not to use the plastic top cap. It just doesn't feel right, even though it would be OK from a functional standpoint. Have been using this for 2 years on a custom build. Works as intended. Good price. Jenson's huge part selection and prompt delivery made my bike build project go better than expected. The set I received contained a top bearing cup measuring 30mm and the bottom cup measuring 30.2mm. Had to return for a refund.